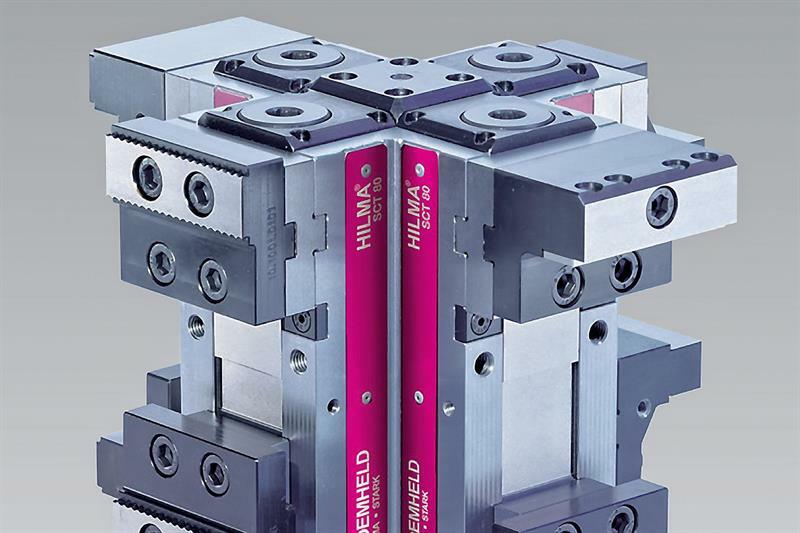 A newly developed range of compact, three- and four-sided tower clamping systems manufactured by the Roemheld group's Hilma division in Hilchenbach will be launched at Southern Manufacturing (5-7 February, Farnborough) on the stand (E255) of Roemheld UK. Intended for use on 4- and 5-axis vertical machining centres, as well as horizontal-spindle machines, the steel monobloc SCT towers, which are either mechanically or hydraulically actuated, are sealed against swarf and other contamination. 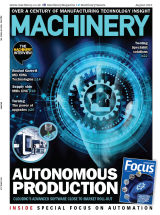 Applications range from use on manually loaded machines, through twin-pallet-change centres, up to fully automated flexible manufacturing systems. The clamping range is from 6 to 210 mm, while holding force is from 25 to 40 kN, high enough to avoid the need to pre-machine workpieces, even when they are secured on just a few millimetres of material. Versions in alternative lengths and with different mounting holes, including for zero-point clamping, together with a large selection of grip, pendulum, step, soft and vee jaws suitable for different machining tasks, complete the offering. Another workholding system on show will be Hilma's range of three MC-P Z balance vices, which have a clamping range being from 6 to 400 mm and a floating clamping pointto avoid stressing or deforming the component. After operation of the spindle, the two slides concentrically approach the workpiece. When the first jaw reaches the component, just the second jaw advances until they are both in contact with the workpiece. Only then is the desired clamping force applied, up to 35 kN for the largest vice, using a torque wrench. From the group's Stark division in Austria, various zero-point elements will be in evidence at the show, such as the compact Speedy Easy Clik for manual mounting with a 10 kN retention force and pneumatic release in one-tenth of a second. Exhibited from the same factory will be module plate sets for offline set-up and direct clamping to any machine table, providing an extendable entry-level system for machining larger components. Dies weighing up to up to 500 kg or 1,000 kg can be manoeuvred with Roemheld's manually operated RW series changing carts, the smaller version of which will be presented at Southern Manufacturing. There is also an electrically-driven RWA cart for handling a maximum load of 1,600 kg. All versions feature extensive safety equipment, including an automatic docking station featuring slip protection. The height of the changing table can be adjusted hydraulically. An optional auxiliary drive is available for the manual carts, allowing a travel speed of 2 km/h.